Let’s start with lesson 21, containing proverbs 201-210. Literally: not to wake up sleeping dogs. You use the expression when you discover something, what others do not know; and you prefer not to tell about it, to avoid any problems. The proverb is typically used in a situation you found out that you were wrong yourself, but not on purpose. Confessing your mistake and trying to solve it, may get you into troubles, while at the same time it is not likely someone will ever find out. For example, you have done a reconstruction at your house, after the municipality gave you permission. But after you finished the reconstruction, you find out that the measures in the permission differ a few centimetres from the end result. The risk of going to the municipality, is that you may meet some bureaucratic procedure and perhaps you have to break done what was made. While on the other hand, this is something, which is never checked. In such a situation you better let the dogs sleep. Literally: to sit behind the geraniums. Another proverb about flowers. Geraniums are flowers that are typically put in boxes, below the window at the facade of a house. If you are behind these geraniums, you are inside the house. Now that explains the meaning: to have an inactive life, usually as a result of being unemployed or because of an elder age. A typical answer, if you ask what a person is planning to do when going on pension; “ik ga zeker nog niet achter de geraniums zitten!” I for sure will lead an active life. Literally: to throw the towel into the ring. Like in English. The meaning is: to give up, or to quit. And the origin is boxing, where a trainer could stop the fight this way. Literally: to have a short fuse. Also in English. The expression is used to tell someone gets angry very quickly. Literally: to throw with the cap to something. The meaning is to deliver bad work as a result of not putting much effort into it. It is believed the origin is a boy game in the past, to catch butterflies by throwing a cap. But that method usually failed. Literally: like a headless chicken. You use it when you start doing something without a plan, or without even thinking. If you cut the head of a chicken, then it will still run for a few minutes. For myself, I have to admit; this expression could be used to describe me going to the supermarket. I never take a shopping list. As a result I go zig-zag through the shop. Als een kip zonder kop. Literally: to encounter the dog in the pot. The meaning is to arrive late, after the benefits have been divided (and consumed). The origin of the expression; in the past, the dog usually got the last bit of food after the family had their meal. So if you arrive and the dog is licking the last pieces of food from the pot, then you’re late for dinner. Literally: to force an open door. You use this expression when someone makes a statement which is so obvious, it is actually unnecessary to say. For example, if you want to be rich, you have to earn money. The expression can also be used without the verb “intrappen”. If you judge the statement itself, then you say: “dat is een open deur”. It’s obvious. Literally: not to go on one-night-ice. The meaning is that you want to make a good decision and you better take your time to think about it. It’s another saying related to our national sport skating. The ice that appears after only 1 night of frost, is too weak to carry someone. So it’s better to wait until it is stronger. Literally: speech is silver, silence is gold. You can actually say it in two situations; first situation when you want to give a hint to some talkative person that he should speak less. Secondly, it can also refer to being discrete. Better not to tell something you’re not supposed to say. And at the same time, let other people talk to collect as much as possible information. We’re almost there with only 4 lessons to go. So, don’t throw the towel in the ring ! 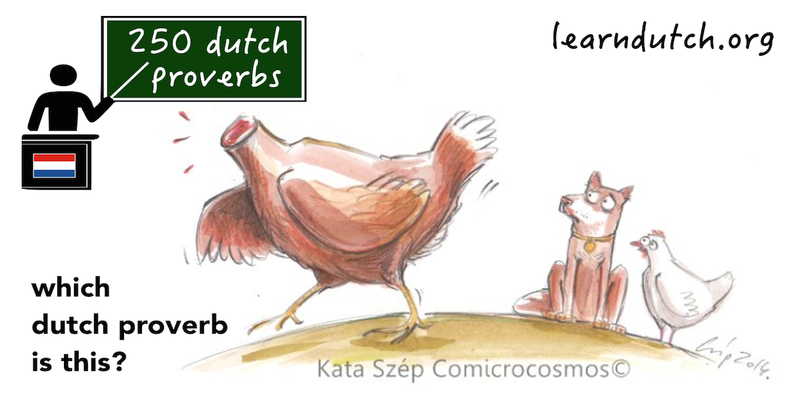 See you back in lesson 22 of 250 Dutch Proverbs.